I've always been a fan of white slipcovered chairs. I find the white cover is easier to keep clean than other colours because you can always add a touch of bleach when washing, if you need to. 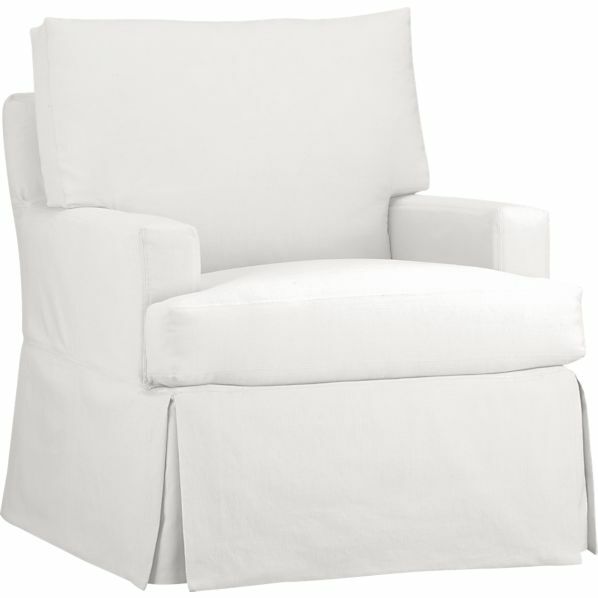 I have several white slipcovered chairs around, and recently I've seen a few that are slipcovered and have a swivel feature. I have two chairs in a sitting area off my kitchen, there's an amazing ocean view out the window here. The picture above is a close up of the chairs and here is the shot of me sitting in one. These chairs above are from Ikea and I had the seat cushions filled with down instead of the foam that came with them. This improvement really changed the chairs and made them a lot more comfortable. Here are a couple of other chairs that I like – with slip covers and they swivel. For this area I have my eye on chairs that swivel since then you can easily face the view out the window or spin around and chat with people in the kitchen. These are a couple I'm looking at. This is from the Pottery Barn but it's too big for my space. And these are both options that swivel, from Crate & Barrel.